Something wonderful has been happening slowly over the last few weeks. You have noticed that the days are getting shorter, the temperature has been a little cooler and you can watch football on Sundays, all the tell-tale signs of autumn. Enjoy this perfect season while you can because winter is just around the corner. We are not trying to ruin your day by warning you about winter, we just want you to be prepared before the temperatures plunge and the snow starts to fly. Driving in the winter can be harrowing, especially under icy conditions or in a blizzard. It’s a good thing that many newer model vehicles come equipped with useful tools like traction control, which helps gain traction in snowy and icy conditions. But you can’t completely rely on these safety features when you venture out in the winter. 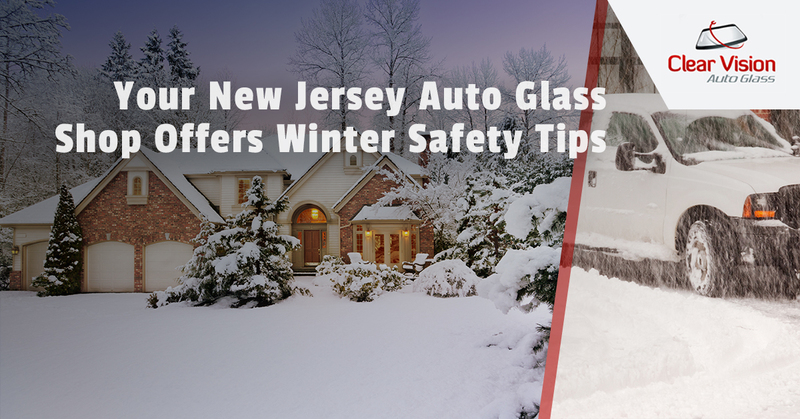 Clear Vision, your New Jersey auto glass shop, encourages you to take to heart the following safety tips to follow when driving in the winter. It is very important that you have your car checked in the fall, before the snow and cold of winter settle in. Have a qualified and trusted mechanic check the fluids in your car to ensure they are properly filled and winterized. Have your snow tires checked to ensure proper air pressure and to see if there is plenty of tread left. You should also have your mechanic check the battery, filters and hoses and fan belts. You will also want an expert check your windshield for cracks and chips and these will get worse in the cold. Make sure you have an emergency kit in your car should you happen to get stranded in a snowstorm. Your emergency kit should include items like a flashlight, small shovel, scissors, blanket, gloves, water and snacks. In addition, you should make sure you have a spare tire, jack, lug wrench, first aid kit and road flares in your trunk. Before you head out on the road, check to see what the weather will be like during the time you are gone. Even if there are no storm warnings or any signs of snow or other inclement weather, you should be prepared for other winter hazards. For example, it may be a nice winter day, but when the sun goes down, the temperatures are likely to drop. If you plan on traveling after dark, make sure you are dressed for the cold temperatures. No matter how well your car does in the snow or how prepared you are when you go out in the snow, there is always a chance you could get stranded. In such a scenario, calling AAA is a smart choice. If you don’t subscribe to AAA or some other similar service, at least have the phone number of a friend or family member who is willing to help you out should you get stranded. If you need to have your windshield replaced or repaired before winter, give us a call.